Our Verdict: The Aspire Platinum Kit includes the well-received Aspire sub-ohm battery and the Aspire Atlantis, one of the best sub-ohm tanks on the market today. For the price, users get a very capable device that is simple enough to use for new vapers and powerful enough for advanced users. The elegant packaging makes this kit a great gift as well. 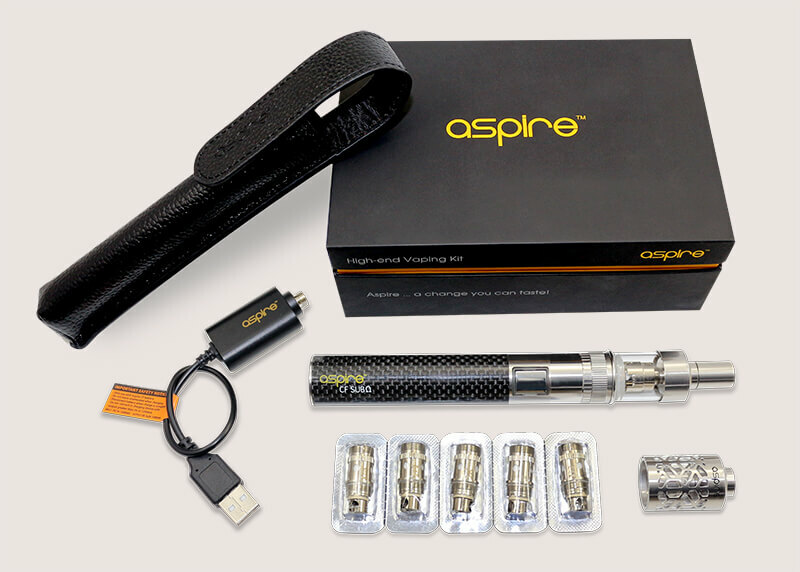 Design: First off, the Aspire Platinum Kit comes in an elegant box that gives users a taste of what’s inside. 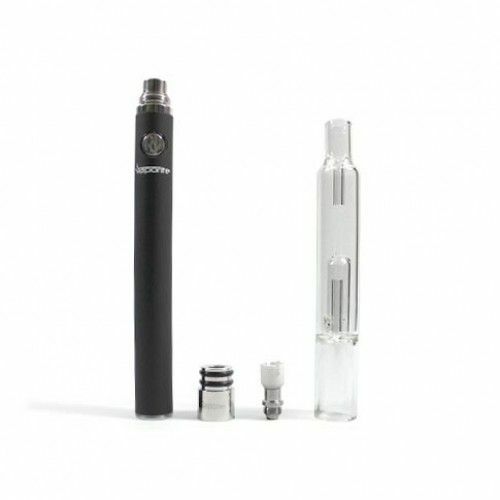 The sub-ohm battery of the kit is made of carbon fiber and is sleek and robust. The tank is the Aspire Atlantis and fits the battery perfectly. There is also a decorative webbed tank that gives the overall device a unique and beautiful look. Included is a carrying case made of real leather, which adds to the overall value of the kit. In all, everything about the kit looks great and users will feel like it costs more than its asking price. Build Quality: The sub-ohm battery is made of carbon fiber, making it light and tough. No doubt it would be able to withstand rough handling on a daily basis. The tank itself is made of glass and steel, so users should take care not to drop it. However, also included is a decorative webbed tank that looks tougher than the stock one. There is also glass in the webbed tank, but since the steel web wraps around it, is more protected. Still, users should take care not to drop it as well. What’s in the Box: For every purchase of the Aspire Platinum Kit, users get one Aspire Carbon Fiber Sub-Ohm Battery, one Aspire Atlantis Tank, five replacement coils, one replacement web tank, one USB charger, one leather carrying case, and a user manual. Using the kit is very easy. The battery is charged using the USB cable, and once charged can be used right away. However, while the battery is charging, users can fill the tank with e-juice. To fill the tank, simply unscrew the top part – the one with the glass attached – then fill it slowly with e-liquid. It should be filled only up to the height of the center post. Once filled, screw the tank back on, then to the battery, and you are ready to vape. To activate the device, one simply presses the button while inhaling. If the airflow is not up to your liking, you could easily adjust airflow using the dial near the tank’s bottom. There are no special rituals here, just fill, screw, and activate. Users will appreciate the simplicity in use here. Vapor Production and Performance: Vapor production from the Aspire Platinum Kit is impressive. The sub-ohm battery outputs at a consistent 4.2 volts to ensure dense vapor with each puff. Combined with the Atlantis tank – which by itself is capable of excellent vapor no matter the mod – the duo performs admirably. Overall performance is superb. The kit is simple and straightforward enough to use for beginners who want to try sub-ohm setups. While the vapor production is more than enough to entice advanced users to get one for themselves. The battery’s output stays consistent throughout its charge, and the Atlantis tank gives users flavor and vapor density that few tanks can match. Battery Life and Atomizers: Rated at 2000mAh, the sub-ohm battery is enough to last casual vapers a day or two. For heavy users, it can last around five or six hours. However, if higher resistance atomizers are used, this can be stretched even longer. The lowest resistance the battery can fire is 0.3 ohms, enough to satisfy cloud chasers. The Atlantis tank comes with five replaceable coils all at 0.5 ohms each. Coils are easily replaced by screwing the head onto the tank. The tank has been touted as one of the best on the market today, so users can expect exceptional performance from it. Taste is excellent for a tank while the vapor production is outstanding. The kit comes with an extra web tank, just in case users want to change the look of their setup. Whether for yourself or as a gift, the Aspire Platinum Kit is an excellent buy. From the packaging to the battery, the tank to the performance, everything is made well and screams quality all around. The leather carrying case is also a great touch, especially since it is made of real leather and not out of imitation plastic. The device itself is super simple to operate, making it a great present for new vapers. The overall performance is outstanding, making it an excellent backup for advanced users. For the price it sells, users will be getting great value. The Aspire Platinum Kit is a highly recommended kit for any level of vaper and make an vaping experience even better. The Vaporite Titanite is a new vape pen that offers some cool features that set it apart from others. Read on to find out more. The Vapor Brothers Vaporizer is considered one of the best bang-for-buck devices out there. Does it live up to the hype? Read on to find out!